AI researcher and entrepreneur Trent McConaghy discusses how blockchain will unlock the value of data by bridging the gap between the AI haves and have-nots and, in turn, helping to create the data economy. The views expressed on this podcast are those of its hosts, guests, and callers, and not those of Harvard Business Review. University of Bath professor Joanna Bryson, a leading AI researcher, discusses the opportunities and consequences of developing human-like computational intelligence. The views expressed on this podcast are those of its hosts, guests, and callers, and not those of Harvard Business Review. Investor Cathie Wood, one of Bloomberg’s 50 people who defined global business in 2018, discusses the five innovation platforms shaping our future and strategies for investing in them. The views expressed on this podcast are those of its hosts, guests, and callers, and not those of Harvard Business Review. Parag Khanna, a leading international relations expert, recently published the new book "The Future Is Asian: Commerce, Conflict and Culture in the 21st Century." He talks about the law of technology diffusion, breaks common myths about Asia's development, and questions whether the future belongs to cities or nation-states. The views expressed on this podcast are those of its hosts, guests, and callers, and not those of Harvard Business Review. Elif Shafak, an award-winning British-Turkish author and human rights activist, discusses the polarization of culture springing out of the foundations of the open internet, and the ways to tackle the pervasive issues in today's digital technology sphere. The views expressed on this podcast are those of its hosts, guests, and callers, and not those of Harvard Business Review. Marietje Schaake, a Dutch politician and member of the European Parliament (MEP) from the Netherlands, talks to Azeem Azhar about the governance of cyberspace, the responsibility of technology companies, and the new era of geopolitical competition in cyberspace. The views expressed on this podcast are those of its hosts, guests, and callers, and not those of Harvard Business Review. Emil Eifrem is the CEO and cofounder of Neo4j, the graph database platform powering some of the largest companies today. He is the creator of the property graph model, and he coined the term "graph database" to describe the technology that would change how we understand big data. The views expressed on this podcast are those of its hosts, guests, and callers, and not those of Harvard Business Review. Jack Clark, the policy director at OpenAI, discusses the state of artificial intelligence development, the geopolitics of technology, and the implications of automation on society. The views expressed on this podcast are those of its hosts, guests, and callers, and not those of Harvard Business Review. Gina Neff, a senior research fellow and associate professor at the University of Oxford, explores technology development from a sociological perspective, as well as the implications of self-tracking and the quantified self for the individual and society. The views expressed on this podcast are those of its hosts, guests, and callers, and not those of Harvard Business Review. Michael Liebreich, a leading global expert on clean energy and transportation, discusses the significance of the U.S. National Climate Assessment and IPCC's report, the importance of staying below two degrees, and the role of exponential technologies in transitioning to renewables. The views expressed on this podcast are those of its hosts, guests, and callers, and not those of Harvard Business Review. Casper Klynge, the world's first tech ambassador, with a global mandate and staff in Copenhagen, Silicon Valley, and Beijing, assesses the current alignment between some of the largest technology companies and nation-states and discusses the role of technology in fostering democracy and innovation. The views expressed on this podcast are those of its hosts, guests, and callers, and not those of Harvard Business Review. Kate Raworth, senior visiting research associate at Oxford University’s Environmental Change Institute, discusses the Doughnut economics framework as the essence of rethinking economics for a world inhabited by 10 billion people and hit by climate change and social justice struggles. Kate sets a vision for an equitable and sustainable future. The views expressed on this podcast are those of its hosts, guests, and callers, and not those of Harvard Business Review. Anousheh Ansari, the world's first female private space explorer and the first Iranian astronaut in space, discusses the ways space development could help us tackle climate change and pollution and achieve sustainable crypto mining. She shares about her journey to become a space explorer, her time on the International Space Station, and her role as the CEO of XPrize. The views expressed on this podcast are those of its hosts, guests, and callers, and not those of Harvard Business Review. Lisa Witter, an award-winning executive, a serial entrepreneur, and the cofounder and executive chairman of Apolitical, discusses reviving trust in government, the road map for building the public service workforce of the future, and the role of agile in governance. The views expressed on this podcast are those of its hosts, guests, and callers, and not those of Harvard Business Review. Matthew Taylor, the chief executive of the Royal Society of Arts, a UK organization committed to finding practical solutions to societal problems, discusses the well-being economy, the meaning of good work in an age of automation, and the state of democracy. The views expressed on this podcast are those of its hosts, guests, and callers, and not those of Harvard Business Review. Andrew Yang, an entrepreneur and author who is standing for president in the 2020 U.S. election, discusses the core ideas behind his platform, why they are necessary, and how to get there. The views expressed on this podcast are those of its hosts, guests, and callers, and not those of Harvard Business Review. Reid Hoffman dives deep into Silicon Valley's attitudes toward government, the role of the state in innovation, and maintaining techno-optimism. The views expressed on this podcast are those of its hosts, guests, and callers, and not those of Harvard Business Review. Entrepreneur and investor Elad Gil talks about Silicon Valley, scaling companies from 10 to 10,000 employees, the state of blockchain, and how blockchain and artificial intelligence will overlap. The views expressed on this podcast are those of its hosts, guests, and callers, and not those of Harvard Business Review. Azeem Azhar and Dr. Mariarosaria Taddeo, deputy director of the Digital Ethics Lab at the Oxford Internet Institute, unpack the state of cybersecurity and warfare, the complex symbiosis between governments and criminal actors, and the ways digital technologies are changing cyber warfare. The views expressed on this podcast are those of its hosts, guests, and callers, and not those of Harvard Business Review. Azeem Azhar speaks with venture capitalist Bill Janeway about the three-player game between the mission-driven state, financial speculators, and markets in the innovation economy. Are we stuck on the dark side of this configuration? How do we move forward? The views expressed on this podcast are those of its hosts, guests, and callers, and not those of Harvard Business Review. Kai-Fu Lee, a VC investor, technology executive, and one of the most prominent figures in the Chinese internet sector and AI, discusses the Chinese government's techno-utilitarian approach to technology, the ambition of China's technology founders, and the future of job automation. The views expressed on this podcast are those of its hosts, guests, and callers, and not those of Harvard Business Review. 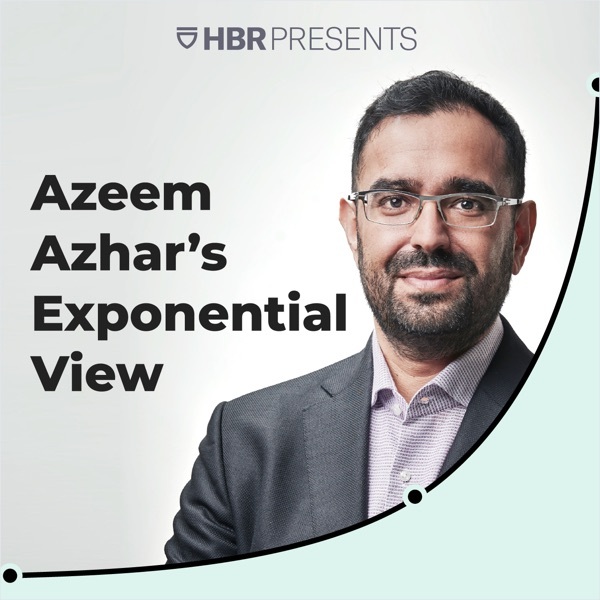 Azeem Azhar's Exponential View podcast is back, exploring the intersection of political economy and exponential technologies. The views expressed on this podcast are those of its hosts, guests, and callers, and not those of Harvard Business Review. We’ve experienced a manifestation of new behaviors, driven by the underlying shifts around the democratic process: the transition from broadcast media to niche media moderated by dominant social media platforms. Have these behaviors hacked our democracy? For better or for worse? Azeem discusses these questions with Carole Cadwalladr, Luciano Floridi, Hari Kunzru, Tom Loosemore. The views expressed on this podcast are those of its hosts, guests, and callers, and not those of Harvard Business Review. Dr. Danny Lange, VP of AI and machine learning at Unity, discusses the role of machine learning technologies in revolutionizing the ways games are developed and monetized. Dr. Lange talks about the significance of the undergoing paradigm shift in computing, the OODA loop in machine learning, and what happens to software engineers when their trade becomes obsolete. The views expressed on this podcast are those of its hosts, guests, and callers, and not those of Harvard Business Review. Author Philip Auerswald talks about “code” in a broader meaning of the word — it is the “how” of human productivity, the manner in which we create, refine, and implement the infrastructure that forms a human society. The advancements of code, from the Neolithic era to the modern times, have driven identity and work reinvention. The views expressed on this podcast are those of its hosts, guests, and callers, and not those of Harvard Business Review. Scott Santens, a writer and an advocate for universal basic income, talks about why he believes “citizen's salary” is a necessary measure for our societies to deal with tech unemployment by providing an independent income floor. The views expressed on this podcast are those of its hosts, guests, and callers, and not those of Harvard Business Review. Marko Ahtisaari, the CEO and cofounder of The Sync Project, presents ideas and projects born out of the vision that in the near future people will use non-drug modalities to heal, enhance well-being, and assist in therapy. He guides us through the recent experiment Unwind.ai, which uses your heart rate to select the tracks that will bring you peace of mind. The views expressed on this podcast are those of its hosts, guests, and callers, and not those of Harvard Business Review. Columbia University professor Jeffrey Sachs, one of the world’s foremost thinkers on economic development, talks about how technology has improved the lives of countless humans. He explores how automated systems will increasingly replace both routine and high-skill jobs. The views expressed on this podcast are those of its hosts, guests, and callers, and not those of Harvard Business Review. Hebrew University of Jerusalem professor Yuval Harari and Azeem Azhar cover the compelling insights in his new book, "Homo Deus." The views expressed on this podcast are those of its hosts, guests, and callers, and not those of Harvard Business Review. Philosopher and investor Dr. Shamil Chandaria investigates how we might live much longer lives and asks how we can make those lives more meaningful. The views expressed on this podcast are those of its hosts, guests, and callers, and not those of Harvard Business Review. A wide-ranging conversation on technology with Jason Pontin, editor-in-chief of MIT Technology Review. He touches on gene editing, Moore's Law, artificial intelligence, Facebook and fake news, and what ties all these disparate strands together. The views expressed on this podcast are those of its hosts, guests, and callers, and not those of Harvard Business Review. Ryan Avent, economics columnist at The Economist, and Azeem Azhar explore issues around digital technologies and how they will continue to exponentially change the relationship between capital and labor. The views expressed on this podcast are those of its hosts, guests, and callers, and not those of Harvard Business Review.